We all want to be part of some kind of community. No one enjoys feeling like an outsider. 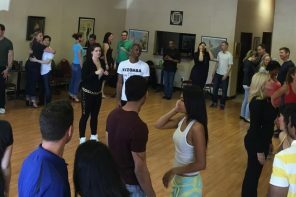 Most of us have connections to multiple communities, whether through a neighborhood, school, job, role or activity like social dancing. However, when life takes us to a new city – or even a new country – we are separated from those communities. 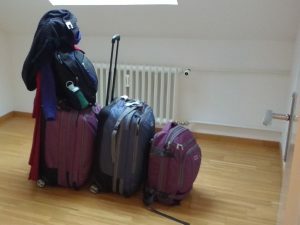 All the logistical hassles of packing and unpacking, finding housing or work, and adjusting to new surroundings pale in comparison to the difficulty of building that sense of community again. I have a lot of personal experience in this area. Although I’m fortunate in that all of my moves have been voluntary, I have nonetheless found myself far from my friends and family, quite often knowing only one or two people in my new home city – if that. The good news is that your love of social dancing is a wonderful asset in the quest for community. After all, connection and social interaction are integral parts of partner dancing, no matter which form(s) you love. I won’t claim that I’ve got a flawless method for finding belonging, but I definite have some solid advice to offer all you dancers who are headed into a new scene. 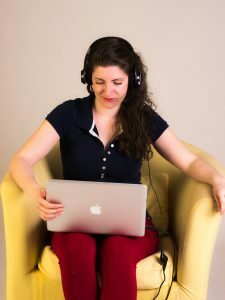 However you feel about digital communication or social media networks, one of the best ways to get started is to go online and search for dancing in your new city. Bookmark the websites of local clubs and venues. Call studios to ask for more details about classes and socials. Send information requests to teachers through contact forms or by e-mail. Of course if there are a lot of opportunities to dance, you might also want to ask for recommendations about which classes or socials to attend. But in my experience, nothing beats having a local who is waiting to welcome you and introduce you to people. Consider making a public post on your Facebook or otherwise reaching out to your friends to ask for their contacts in your new city. Thanks to all the travel to dance events, on top of our increased mobility, chances are you know someone who knows someone, and that’s a great place to start. Whether you’ve got a contact or are just showing up cold, be prepared to put yourself out there. Smile at people. Go up and introduce yourself to dancers on the sides of the floor. Ask for people’s names as many times as you need to. Own the awkwardness and ask to add friendly people on Facebook or WhatsApp or whatever so that you can keep in touch about what’s happening in the scene. Attend any class before the social. If you’re a beginner, it’s a good opportunity to learn about how the dance works. Regardless of your level, it’s the perfect time to rotate through a bunch of partners so that there will be familiar faces to look for during the dance. If it wasn’t addressed in class or you missed it, ask people about local etiquette. How many songs do people dance together? Are there some kinds of moves that aren’t allowed on the social floor? Who can ask for a dance? Hopefully the answer to that last will be “anybody,” because then you can continue putting yourself out there. Go to one social dance night regularly. Particularly in cities that have a lot of dancing going on, it’s important to become a regular in at least one venue. You’ll get to know the people who love that social night and they’ll start to recognize and expect your presence. Similarly, you can join a class series so you’ll get to know your classmates while improving your skills. Look for ways to get involved with the scene. Show up early to help set up or stay late to clean up. Locals will notice your helpfulness and remember you. Ask about volunteering to work the door – it can be an opportunity to save money on entry, but better yet it gives you the chance to greet and introduce yourself to everyone who comes in. Find out if there are any upcoming events for which the organizers need help. It can be tiring to keep making the effort to connect with dancers in a new community, particularly if it doesn’t seem to be coming easily. Try to give people the benefit of the doubt, even if you feel like they ignored you or were rude at first. Especially if you’re a beginner, be patient. While cliquishness can be a problem in dance scenes, it may just be a case of people being reluctant to invest in you until they’re sure you’re going to stick around. It’s also tiring for dancers established in the scene to keep making overtures of friendship to people who don’t come back. Ask people about meeting up outside of dance to show that you’re interested in them as friends and not just as dancers. So far I’ve given a lot of advice to individuals looking for a place in a new community. As important as that solo effort is, ideally we should want our dance scenes to meet newcomers halfway. 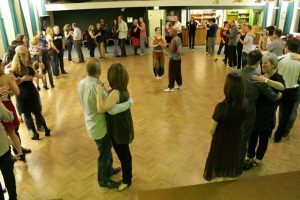 There are lots of ways to help new people, especially beginner dancers, feel welcome. – Have regular beginner lessons before socials – especially ones that might be a bigger draw to outsiders, like nights with live music or a special performance. Be sure to include information about your scene’s dance etiquette. Don’t assume that these things are common sense, because norms vary hugely from city to city and from dance to dance. – Consider designating a welcoming committee. That could be a core team or a rotating duty. Those people make it their goal to find every new person, introduce themselves, find out something about them, introduce them to other dancers, inform them about classes or events that might interest them, and of course, dance with them. – Organize some kind of mixer or icebreaker game, whether at the beginning of the dance or sometime in the middle, for example after announcements are made. There are so many ways of doing this, but I particularly like mixers that start with the new people in the center. – Follow up with newcomers. Have a contact form at the front. Add them on Facebook and invite them to upcoming events. Include them in social occasions that aren’t centered on dancing as well. As several people pointed out on my recent Facebook discussion, it’s important for a dance scene to engage all its members, not just beginners, in a way that builds community. Here are some practices that I have found in the strongest dance communities, in no particular order. – Foster learning. 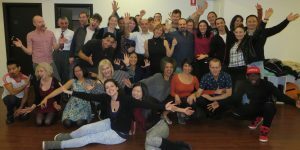 Regardless of how big or experienced your scene is, meet regularly to practice and exchange ideas. Have classes not just for beginners but for more experienced dancers. Invite teachers from out-of-town to come teach on a weekend. 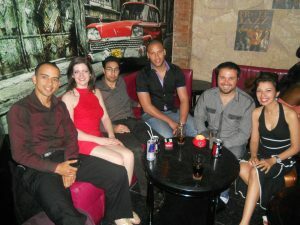 – Take group photos regularly, post them on Facebook and tag people. I know plenty of people do this as a marketing practice, but it also really helps dancers find each other on Facebook (and of course to hold on to happy memories of dances past). – Write a code of conduct. Clearly lay out what the expectations are in terms of dance etiquette and what will happen if people behave inappropriately. Codes of conduct provide guidelines for newcomers but also describe shared values of the community. They make addressing problem behavior more straightforward, because the standards are there for everyone to see. I have gathered some resources about etiquette and writing a code of conduct, as well as related topics. – Go to events out of town together. Carpool to a live show. Travel together to a workshop or festival. See if you can arrange for accommodations together. 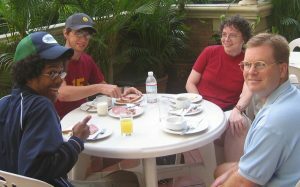 Of course you want to meet new people when you travel, but having a home group can provide comfort to new dancers in addition to being a bonding experience for everybody. – Have social time outside of dancing. Do something outdoors, like go hiking or even camping. 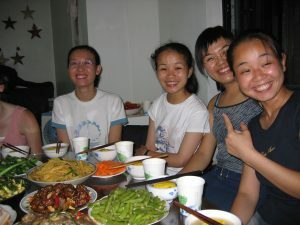 Have a potluck dinner before a dance. Go out for breakfast after a party. Organize a movie night. Get together for a picnic in the park. Having time to get to know one another in a context that doesn’t require dancing experience or skill makes a huge difference. Whether you are trying to feel at home in a new dance community or want to make your scene a more inviting place, let us know which strategies you have used or would recommend. We are all about the social aspect of the dance community! Great article and really helpful and inspiring. Rachel’sFacebook link at the end of the article is broken, please provide the correct one. Thanks for the heads up! The link is working now.